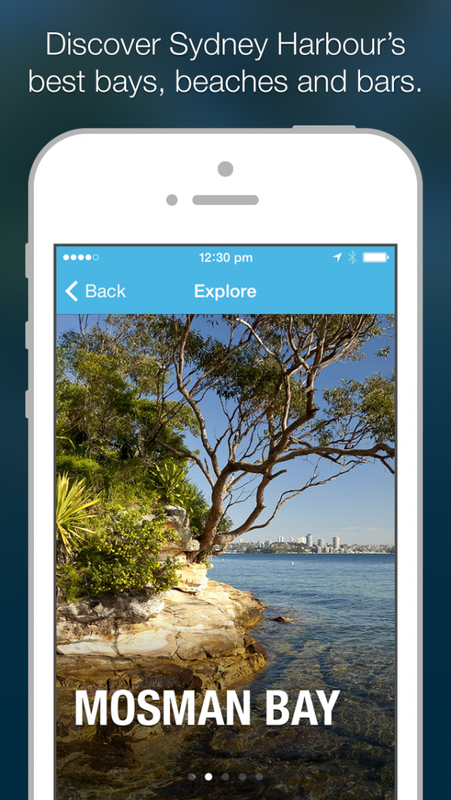 Thirst for Sydney is an iPhone travel guide app to exploring Sydney Harbour's best bays, beaches and bars. Five curated itineraries integrate with ferry timetables, maps and step by step walking directions to explore harbourside neighbourhoods — helped along by lively commentary, photos and reviews. Written by a Sydney born-and-bred travel writer, the guide also includes exclusive insider tips from ferry masters and crew, who for the first time ever have contributed to an app. A real-time interactive feature allows locals and travellers to connect and meet up at harbourside watering holes along the way. The project brief was to combine curated travel with mobile technology — so that locals and travellers can connect, meet and discover even more. While the core concept is a travel guide that is both independent and original, the innovative factor behind the project is real-time interactivity that connects locals and travellers. Travellers love meeting locals and locals love meeting travellers. Thirst for Sydney makes it happen. For users to connect and meet, they create a profile, which includes a photo, name, gender and whether they’re a local or a visitor. They can then write reviews of food and drink venues, featured in itineraries, and connect in real-time with other users who may want to meet up at venues along the way. Friends can also create groups to meet other groups while following itineraries, which are effectively fun day trips. All communication is contained within the app, and doesn't include integration with social media – meaning no social media trails. To respect privacy and keep content fresh, only two weeks’ worth of conversations are shown for each venue. It’s a constantly shifting two week timeline that moves each day. Thirst for Sydney is the first in a series of planned apps that will explore cities in this unique way. Some travel guides are too ambitious. Thirst for Sydney is an introductory guide that doesn't take itself seriously. Content is light in tone, conversational, and has been designed specifically in small chunks for mobile use. When users start the app, they are presented with three simple options: profile, group and explore. •	‘Profile’ includes photo, name, gender and whether local or visitor. Profiles are optional. •	‘Group’ allows friends to create a group or join a group, to meet other groups. •	‘Explore’ launches a screen with 5 itineraries, which can be viewed as a list (hero image with text) or map view. The five itineraries are themed and explore different aspects of Sydney Harbour. Itineraries can be viewed in three modes. •	‘Info’ shows overview, along with highlights of “What You’ll See” – photos that can be flipped to reveal descriptions of landmarks and neighbourhood. Includes local Aboriginal (Koori) history. •	‘Guide’ provides segmented step-by-step instructions, integrating ferry timetables, walking directions, maps, photos and venue information. Estimated distance and times to complete segments is shown. •	‘Map’ shows the entire route. Featured venues have three options. •	‘Info’ details opening times, atmosphere, food and drink options, and a staff photo. •	‘Reviews’ allows users to read and write reviews, opting for a plus (positive) or minus (negative) symbol. 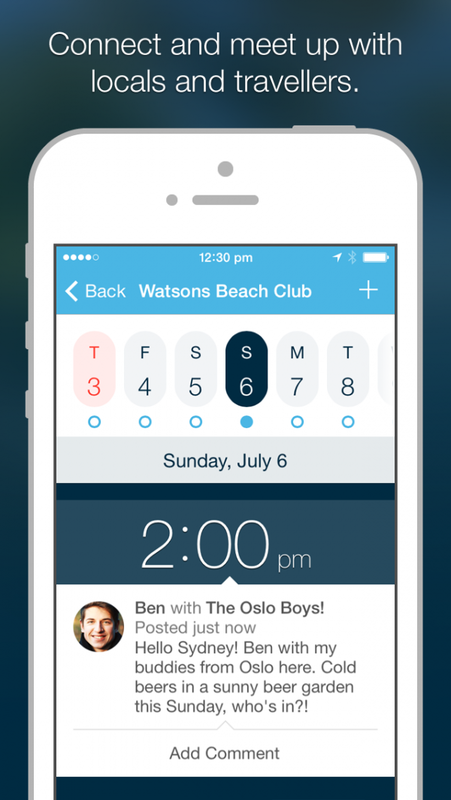 •	‘Connect’ allows users to scroll through a two week calendar to view meet up requests or announce a planned visit. Along with social media, we’ll engage travellers and Sydneysiders with a mix of editorial and promotional stories placed in newspapers, magazines, websites and blogs – both in Australia and overseas. We’ve built relationships with featured venues, who are encouraged to interact with visitors using the app. All conversations take place within the app and are contained within a constantly moving two-week window, where conversations older than two weeks drop off. There is no social media trail. We have a high level of security to guard against unauthorised access and disclosure. Data transmission is encrypted.